We just unloaded a dumptruck full of vintage again on the website. We have some great Star Wars posters, carded figures, and coins. New toylines are on the horizon, and this week we've added Dukes of Hazard and Buck Rogers! GI Joe 25th Anniversary Wave 8 is now in stock, along with 2008 Star Wars Wave 2! Hurry up and place your order for a Gentle Giant Life-Size Leia monument, only $799.99 and shipping soon! For more great stuff, check out www.brianstoys.com.! Disney has the usual large assortment of Star Wars merchandise at this years Star Wars Weekends, including posters, pins, figures, apparel, and more! Check it all out at StarWars.com! The latest Sideshow newsletter reveals their next diorama: Ambush on Hoth. Click here for the sneak preview! Hi - Here is a quick update from http://www.bigbadtoystore.com about another batch of exciting new preorders, and a variety of new arrivals. Hi Everyone. We've updated our site with the newest June pre-orders and some great new arrivals. Major themes for this months pre-orders include The Watchmen, The Dark Knight, Iron Man, Indiana Jones and DC Comics items. The DCSWCC is spreading the word about their third bi-annual charity lapel pin sale. Read on for all the details! The latest Hasbro Q&A Roundup is over in our forums. Stop by to get all the latest questions (and answers) from around the web! It's vintage overload here at Brian's Toys! We've added tons more products to our already huge selection of Star Wars vintage. 25th Anniversary GI Joe Comic 2-pack Wave 4 is in-stock. All current Indiana Jones figures are in stock as well. While digging around our warehouse, we dugg up a replica mask of the Marvel villiain, Doctor Doom! Check it out as well as other awesome collectibles at www.brianstoys.com! Matthew Stover adds another cog to the Star Wars universe. This October the new hardcover Luke Skywalker novel, Luke Skywalker and the Shadows of Mindor hits the shelves. Get all the details here! Non-attendees get their chance to secure the SDCC Exclusive Aayla Secura 12" figure. Pre-Orders begin today at 10AM PDT! Hasbro has all the details on the upcoming release of the Millennium Falcon, which features cool new electronics, working gunner stations, illuminated dejarik table, and more! Click here to read the full report, and keep your eyes open for Comic-con coverages, where the new Falcon will be unveiled! Don't forget... today is the day for attendee pre-orders for the SDCC Exclusive Aayla Secura 12" figure. Pre-Orders begin today at 10AM PDT! ALL are priced below retail price and once they leave the Vault, they won't return. On all FX sabers, there are now less than 10 of each in stock. At $85 is it a wonder why they are selling fast?!? Still in stock are mini lightsabers, helmets and blasters, Pirates of the Caribbean small items (necklaces, rings, key's, coins) as 2 mini lightsaber/blaster cases left. Go to www.thesabervault.com to order! Hi everyone! The team at Urban Collector is highlighting our recent new arrivals along with some Iron Man and The Dark Knight Collectibles. Have a great week! Stop by Topps.com and check out all the details on the upcoming Clone Wars set. This set contains the usual wide variety of chase cards, including Sketch Cards, Foil Cards, and Motion Cards. The Cards go on Sale July 26th. The Medicom RAH Royal Guard 12" figure is now up for sale at Sideshow Collectibles. It looks like we are finally getting the Dark Lord himself... Check out Sideshow's latest 12" teaser...and what a tease it is! Hi - Here is a quick update from http://www.bigbadtoystore.com about another new wave of preorders, more new arrivals, and a new overstock sale. StarWars.com has loads of information for Celebration Japan, including the return on the convention medallions. Check out all the details here! Today is the last day to download your free copy (pdf or audio) of Legacy of the Force: Betrayal, and the first day to pick up your copy of the final installment in the 9-part Legacy series, Invincible. With the ad for a new book, entitled Millennium Falcon appearing at the end of the newest Legacy of the Force book Invincible (on store shelves tomorrow) it was widely suspected that this meant Del Rey's contract with Lucasfilm for more Star Wars books was extended. We contacted our sources at Del Rey and we can now confirm this to be the case! So that means more great Star Wars fiction to come from Del Rey. We expect an official announcement from Lucasfilm's Sue Rostoni to be forthcoming. Tons of Star Wars vintage accessories and carded figures have been recently added to our huge inventory, from clocks to complete coin sets. 30th Anniversary Luke McQuarrie and Saga 2 501st Stormtrooper are back in stock! New Indiana Jones Legos have been added, which includes the Temple of the Crystal Skull. Major League Baseball has finally been added to our new Starting Lineup section, featuring star players from 1998 to 1994. Check out new Sideshow and Gentle Giant pre-orders such as the Darth Maul and Obi-Wan Animated Maquettes. To get more collectible toys from Star Wars to Masters of the Universe, check out www.brianstoys.com! If you didn't catch it on TV, and you didn't make it to Speed Racer tonight (just got back... sweet flick! ), then stop by StarWars.com and check out the animated goodness from the new Clone Wars Trailer! Hasbro updates today outlining the upcoming Droid Factory series, showing off the Wal-Mart exclusives. Click here to read all about this series of 6 sets coming soon! Ready for The Clone Wars? On May 8 the trailer will be premiering across 5 networks, and on May 9th in theaters, along with the brand new poster! You can pre-order the full-sized theatrical one-sheet at StarWarsShop.com right now! And, to top it off, every order at SWS this month gets a free Wizards of the Coast gaming miniatures 2-pack! Stop by StarWars.com for all the details on the upcoming trailer premiere. Hi everyone! We've recieved a ton of new goodies in over the last week and wanted to highlight our new items as well as showcase more May '08 pre-orders. Here are our featured featured items, but visit Urban Collector to see our entire selection of fan favorites. 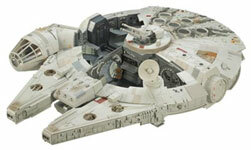 Check out the latest Brians Toys Newsletter for all of this weeks deals on Star Wars and more! Make sure you stop by the official page of the Disneyland unofficial Star Wars Fan Day and check out all of the details of the upcoming June 28th event. Here is a quick update from http://www.bigbadtoystore.com about a wide variety of new preorders and many new arrivals. We are also running another sale for the next few days! Sideshow Collectibles has their full lineup of SDCC exclusives listed... including a two nice Star Wars exclusives: Aayla Secura 12" figure and a Shadow Guard VCD. Check out the full SDCC lineup right here! Look for these to go on sale on May 22-23 for Aayla, and June 5-6 for the Shadow Guard.